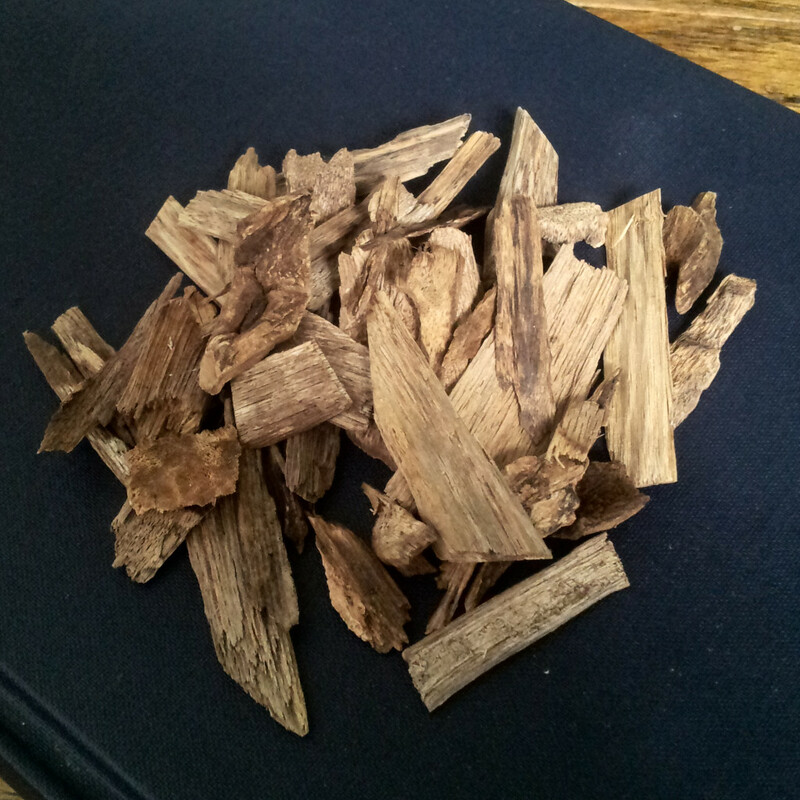 Aloeswood is a rare and intensely spiritual wood, also known as agarwood and lignum aloes, that has been used for millennia in both Eastern and Western magic. Not to be confused with the aloe vera plant, Aloeswood is the resinous heartwood of several species of large trees native to Southeast Asia in the genus Aquileria. The fragrant wood is only produced in individual trees as a defense response to a fungal infection in a process which takes years. Only about seven percent of the trees in the wild are naturally infected with the fungus, and this rarity has led to past over-harvesting and significant risk of poaching. Currently, thanks to new inoculation techniques, sustainable plantations have been established in Malaysia and Sri Lanka. Generally called lignum aloes in old grimoires and texts, it is often classified as having solar virtue, which as the Astrologer William Lilly describes “are plants that smell pleasantly, are of good favor … strengthen the heart and comfort the vitals, clear the eyesight, resist poison, or dissolve any witchery or malignant planetary influences.” Agrippa includes it in several of his planetary suffumigations, and it’s also one of the ingredients in the incense in the Book of AbraMelin the Mage. Aloeswood is also mentioned a number of times in the Bible, where we find three main uses: sanctification, sensuality, and embalming. In many of these instances, it’s written of in conjunction with myrrh and cinnamon (or cinnamon’s relative, cassia). Our own consecration incense reflects this ancient relationship. Incidentally, the dual use of scents for the purposes of sanctification or making something holy and for a sensual aphrodisiac may seem strange to our modern view, but this probably more reflects our separation of body and spirit inherited from overarching monotheistic morality. An early modern materia medica mentions aloeswood being used in the East as an incense burned in holy temples as an offering, but also as a cordial to strengthen the mind and spirit and preserve the memory. Even today, aloeswood is an oft-used incense ingredient in high quality Japanese incenses, and very high grades of the wood are burned and savored at special occasions and fancy parties. The resinous wood also still finds use in Traditional Chinese Medicine and Ayurvedic practice. The scent of aloeswood is highly complex: sweet and woodsy and earthy. We believe its nature is one of sanctification, bringing (or augmenting) holiness to the physical plane. Much like frankincense, it has an uplifting nature as described by Lilly in the quote above. As such, it’s useful as a temple incense, to establish sacred space and attract good spirits, and to strengthen and cheer the mind and spirit.